This seems to be the season of movies featuring what I would consider strong Stoic characters. I have recently written about The Martian, the story of astronaut Mark Watney, played by Matt Damon, who faces overwhelming odds against his survival as a stranded human being on the red planet. Now is the turn of Bridge of Spies, a Cold War movie directed by Steven Spielberg and co-written by Matt Charman, Ethan Coen and Joel Cohen. 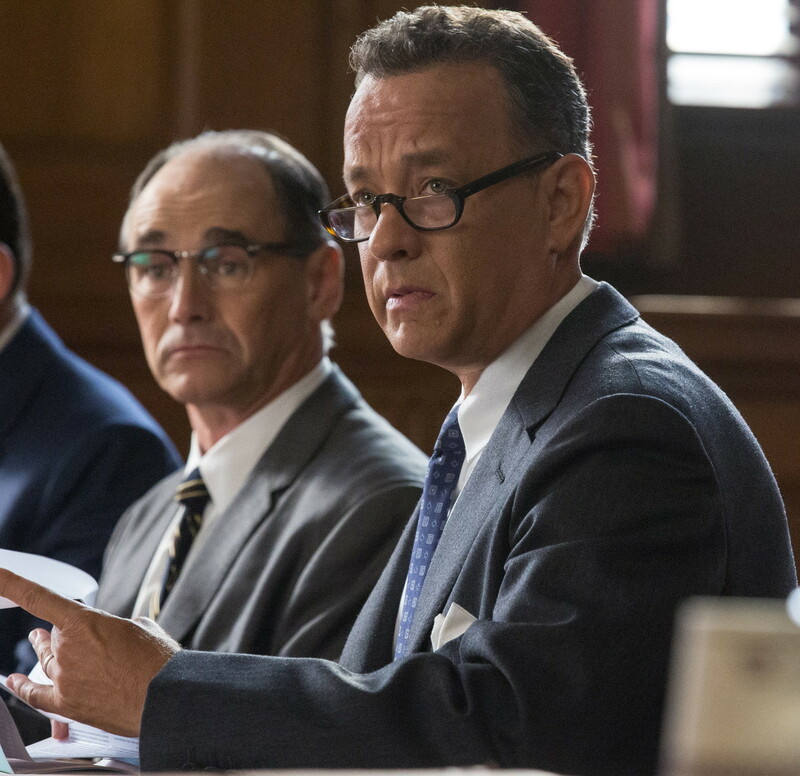 The two major characters in it, lawyer James Donovan (played by Tom Hanks) and accused Russian spy Rudolf Abel (played by the excellent Mark Rylance), display the sort of virtuous behavior Stoics strive for — unlike, it must be said, most of the other characters in the movie. And what makes Bridge of Spies even more intriguing than The Martian is that it isn’t science fiction, it’s based on actual historical events. Without too many spoilers (this is, after all, a thriller!) the basic outline of the story is that Abel is arrested for spying (which he was, indeed, doing), and Donovan is tapped by the US Government — with the support of his boss, Thomas Watters (played by Alan Alda) — to give at the least the appearance that the alleged spy is getting a fair trial. Nobody, beginning with the judge in charge of the trial, but excepting Donovan, appears to have any actual interest in respecting Abel’s constitutional right. The reasons I think of Abel and Donovan as Stoic characters are different. Abel is, indeed, a spy for the Russians, though as Donovan points out, he is not a “traitor,” but rather a loyal servant of another cause. The fact that we think that that other cause was not morally defensible is, of course, a relevant matter, though it isn’t like the US Government behaved in anything like an impeccable fashion during the Cold War (e.g., the McCarthy witch hunt, Vietnam, and so forth). Abel, in the movie, also displays a very Stoic attitude toward externalities he cannot control. On more than one occasion Donovan looks at him and asks: “aren’t you worried?” (e.g., of ending up on the electric chair). Abel’s response is “would it help?” Epictetus would have been satisfied. So Abel displays courage, as well as an appreciation of the dichotomy of control. But of course he is not a Sage, or he would also realize that — as much as the American cause is hardly as obviously right as the Americans themselves think — the one he is working for is even worse. Yes, loyalty is generally speaking a good character trait, but not when it is in the service of tyranny and the practice of shooting people for wanting to live under a different system. Donovan is much closer to the Stoic ideal. Not only he displays courage, both physical and moral, on several occasions. He is also wise, in the sense of having a good grasp of what the right thing to do is under a variety of difficult circumstances. And he has a strong sense of justice that leads him to forge ahead at great risk, to his own physical safety, his job, his reputation within his community, and even of losing the support of his family. The movie is an inspiring tale of integrity in the face of great adversity, and the main character clearly represents a role model for viewers with a philosophical bent. It is also noteworthy that Donovan behaves as a virtuous person, not as a utilitarian, and arguably not as a deontologist either (though the latter case is perhaps a bit more ambiguous). He never seem to engage in a broad calculus aiming at maximizing one type of outcome or minimizing another one, but rather examines each complex new situation and tries to make the best choice available, the consequences be damned. That is a course of action that is simply not open to a utilitarian, and I cannot but be convinced that a utilitarian Donovan would not have made for a character worthy of being a role model. In terms of deontology, one could argue that Donovan does what he does because of a strong sense of duty. But duty is a concept recognized also by virtue ethicists, so the difference between the two approaches cannot lie there. The real problem with deontological systems like the Kantian one (and let us not forget that Kant’s concept of duty was, in fact, influenced by the Stoics) is their inflexibility. Kant famously said that the moral law is to be upheld at all costs, including that of the destruction of the world, but a virtue ethicist would be pragmatic in that respect: if the world gets destroyed, then what’s the point of being virtuous? Sure enough, Donovan throughout the movie is principled, but also very pragmatic. He is able to adapt to new situations while pursuing his broader goals, and one gets the impression of a principled adaptability, rather than a principled rigidity. This entry was posted in Stoicism & pop culture on November 5, 2015 by Massimo. The idea that Kant is not practical is what I call the Utilitarian interpretation of Kant. A better interpretation would be a Stoic interpretation where Kant primary goal was establishing a Metaphysic of morals rather than one based on utility or practical consequences. Just as the Stoic ideal of sage is never reached (which doesn’t seem to bother anybody) so Kantian metaphysics can be modified by a sound anthropology in particular cases. Good review. It was a fine movie. Nothing special, but still definitely worth the watch. Well, I’d say that someone who insists that the moral law is to be upheld even if it means the end of the world is slightly impractical, even as an idealized endpoint. Still, there are indeed Stoic influences on Kant, via the concept of duty; just like there are Epicurean influences on utilitarianism, via the contrast of pain/pleasure. I greatly enjoyed your earlier recommendation, The Martian, reading both the book and seeing the movie. Now I will read Strangers on a Bridge and then see the movie. Indeed. Life is complex, nuanced and always surprising. Rules cannot cope with every situation while the principles of virtue ethics can applied to any situation.